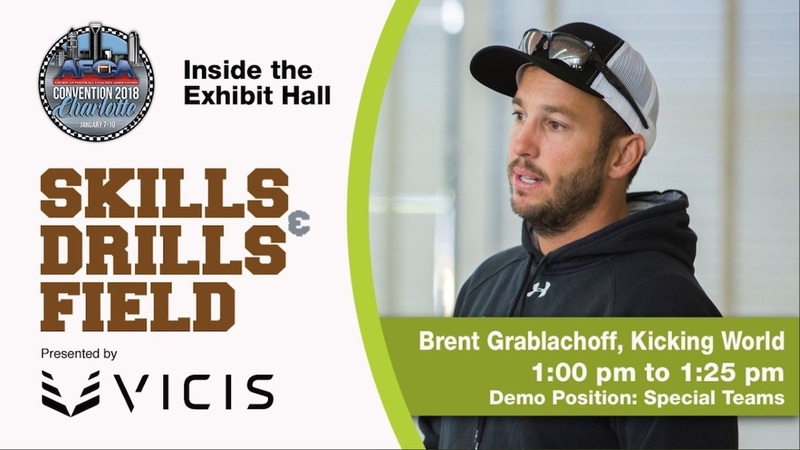 Brent Grablachoff spoke at the 2018 AFCA Convention in Charlotte, NC and was part of the inaugural ‘Skills & Drills’ on-field coaching session sponsored by Field Turf. 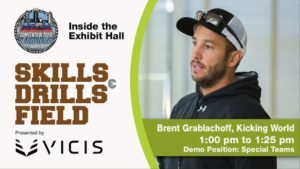 It was a tremendous opportunity for Brent to pass his knowledge on to over 100 college football coaches in an interactive session. Coaches learned fundamentals and drills that they can now implement into their practice routine for their own players next season. ﻿﻿﻿﻿ The UNC Charlotte Football team’s specialists (kickers and punters) helped Coach Brent, as well 2x Super Bowl Champion (SF 49ers) Mike Cofer, who is a staff coach with Grablachoff at Kicking World also lent a hand. The approximately 30 minute segment was quick moving and lots of knowledge was dropped in a short amount of time. 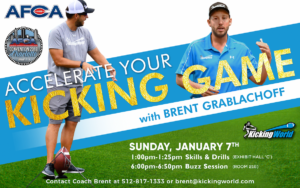 Every weekend on TV whether it be College Football or NFL games, we see teams missing ‘easy’ kicks and there is simply a lack of good coaches out there who specialize in kicking and punting technique and fundamentals. One of the common misconceptions is that a Special Teams Coach knows how to coach his kickers and punters. That is not true. Most are focused on schemes and coverage; not the intricate steps of the kicking process. That is where Brent Grablachoff comes in! Not only does he coach students year-round, he also makes it a point to get around to the clinic and convention circuit and educate coaches so they can better help their players. Brent Grablachoff thanks the AFCA for providing a platform for HS and College Football coaches to bond and grow together every year at their annual AFCA Convention. Special thanks to Mario, Alec and the crew for allowing Brent to speak year after year!